The new Audi R8 V10 Spyder is the second generation of the Audi’s famous supercar and it’s due to go on sale in India soon. We drove the car around some spectacular routes in Costa Brava, Spain and were pretty impressed with the car. It gets a 5.2-litre V10 engine that develops 540PS and 540Nm. The motor is mated to a 7-speed dual clutch transmission. 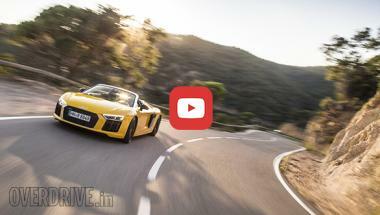 The car will join its sibling, the R8 V10 Plus coupe in India. Watch our video review to discover what it feels like to drive.